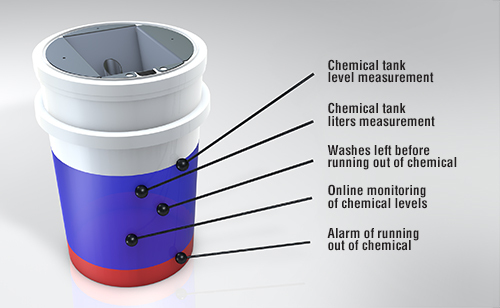 The Smart Barrel is a storage container for the supply system of wash chemicals. Thanks to its pouring trough, chemicals can be refilled safely and neatly with no splatter. The Smart Sensor surface level measuring device can be added to the storage tank, which will monitor the surface level of the storage tank. The fill levels of the storage tank can then be checked on the my-smart.net cloud service, and an alert can be received by e-mail if a product is running low.